Research continues at Images in Bloom. What now? Oh, more mens products. We have had requests for a shaving cream that is readily usable, chemical free, and aerosol free. First – What is Shaving Cream? And how does it differ from Shaving Soap? So the main purposes of shaving cream is to act as a smoother on the skin, and as a way for the hair to stand up more to create a closer shave. We love the challenge of creating products that suite the needs of people that want a more healthy option than is offered in the mainstream. So many of the shaving products contain lots of chemicals, and are put into canisters with propellants that can be avoided. We went to work researching recipes, and formulas for shaving cream. Its quite interesting to note that commercial manufacturers have been slowly replacing wholesome ingredients for synthetic and chemical ones to increase the shelf life of their products and decrease the cost of the materials. When the option is there to go chemical free, and use great ingredients, with the cost just a small amount more we think it is worth the added cost. And the harsh chemicals that stabilize and lengthen shelf life also wear down the razor blades quicker. Several trials, and i think we have a formula that works. It is a blend of oils that have been whipped until they are the consistency of butter cream frosting. 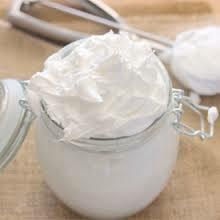 Adding a small amount of essential oil and the shaving cream will remain whipped and ready to be used just as is. Now the next step is to work on the packaging. We purchased flat jars and need to just create labels that will work on the jars.